There’s a fantastic scene at the end of season 3 of Weeds in which Nancy, deciding to start over from scratch, sets fire to the house and everything in it. For Russ and I, that’s sort of an enticing idea right now. Rest assured that we wouldn’t actually do something like that, but it would certainly eliminate the seemingly never-ending process of sorting and getting rid of our stuff. We were talking this morning and feeling like it was so easy to make the decision to go on this trip. And it would be just as easy to up and leave next week. But this intermediate step of sorting out all the minutiae of our lives is proving to be much more difficult then either of us expected. There’s the simple fact that we own a lot of things and we have to look at each and every one of them and decide whether to keep it or get rid of it – and once we’ve decided to get rid of it, we have to decide how to get rid of it. Then there’s the much less simple issue of thinking all of those thoughts that rumble through your brain when you’re digging through things you’ve collected over 20-some years. And I put all of this up here because this whole getting ready to go step is much less glamorous than we expected – and we’d like to be honest about the experience for anyone hoping to follow in our footsteps. Because of my day job, weekends are my time for cleaning and sorting – and this weekend will be no different. Except that I’m getting tired of it and wishing I were done already. There’s this image in my head (which Russ shares) of this day when we will practically be camping in our apartment because it’ll be so empty. It may take another month to get to that magical day, but I’m going to put it up as the carrot at the end of the stick (like this great photo I found online of a couple leaving New York to live in Africa). What a great metaphor. 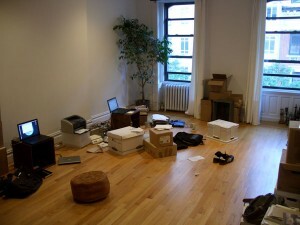 I remember my first apartment after college – how empty it was when I moved in – and how much time I spent at Target and the Flea Market in search of whatever it would take to make it less barren-feeling. I don’t think I ever could have imagined how much things would turn around.